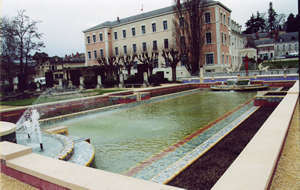 Lucien Beaufrere Public Square or Abbey Garden, surrounded by the river Yevre and the Canal de Berry, has been classified since August 1996. This Art Deco square was built between and 1935 by the architect sculptor, native of Anjou, Eugene Henry || KARCHER. This garden was the first to be enlighted with electricity. Have a walk and discover the war memorial (univeiled on November 11th 1933) the rest area, the basin and the gates with their wrought iron doves. At the entrance, the auditorium (inaugurated on April 1935) shows an open air theatre. It is a building with columns decorated with mosaics made of Denbac ceramic and ironworks.